It's gloomy and foggy, and I haven't seen the sun for days. It's a few more weeks before field season (Death Valley! ), but I can't help exploring the sunnier places from warmer times. I'm looking back at the pics from our fall semester where we explored a lot of places in the Sierra Nevada that aren't Yosemite. That's the thing. Say "Sierra Nevada", and a lot of people will immediately think of the beautiful valley of the Ah-wah-nee, John Muir's favorite place on the planet, and in many ways mine as well. But the floor of Yosemite Valley is about 7 square miles. The national park covers 1,190 square miles (3,081 square kilometers). But the Sierra Nevada? It covers 39,612 sq miles (102,594 km²). 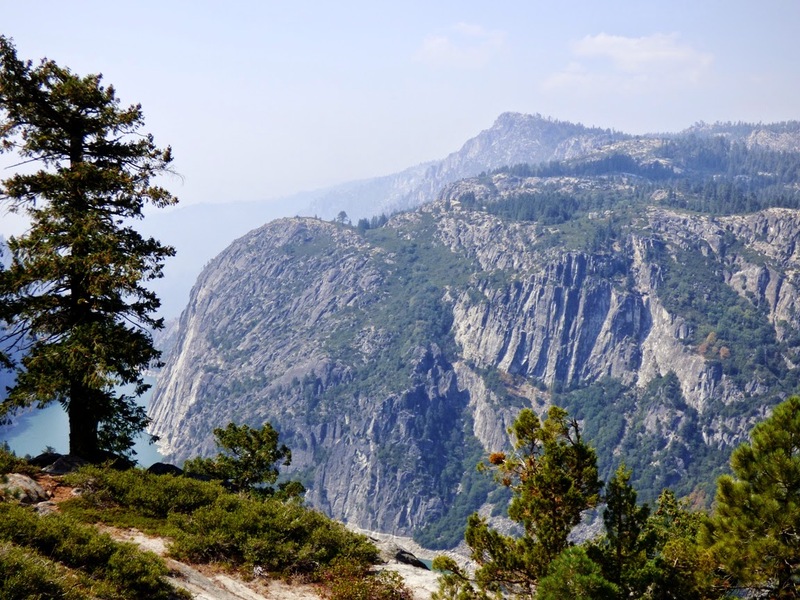 You could hide more than 30 Yosemite parks in the rest of the range. It is in fact the largest single range in the lower 48 states (large mountain systems like the Rockies and Appalachians are made up of numerous smaller sub-ranges). So we are off onto a short exploration of some of the wonderful corners of the Sierra Nevada that aren't Yosemite Valley. 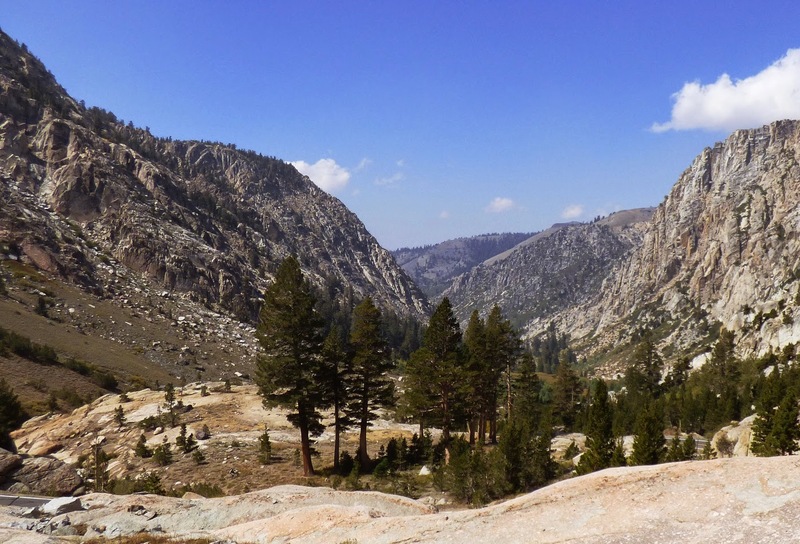 We are following a week's worth of our trips last fall that took us over the range at Sonora Pass and down the east side of the range as far as Lone Pine and Mt. Whitney. We'll also explore the other national parks of the range, Sequoia and Kings Canyon, which we visited on a second trip. We began our journey in some serious smoke from a series of fires burning through the western slopes of the Sierra Nevada. The drought and the fires have been catastrophic. We made a stop at the Twain Harte Lake exfoliation site. I wrote about it back then, and it was picked up on Reddit and IFLS, links that led to the post being the most read ever on Geotripper (12,400 hits and counting). We emerged from the smoke and climbed the upper reaches of the Stanislaus River, approaching Sonora Pass, which after Tioga is the highest paved highway over the Sierra Nevada at 9,624 feet (2,933 meters). Tioga Pass in Yosemite is 9,943 ft. (3,031 m.). In a series of ice ages, glaciers covered about 30% of the range, reaching as low as 3,000 feet or so in some of the deeper canyons. Yosemite is simply the most famous of the glacially carved gorges, and many others are of incredible and spectacular beauty. This was not always fully appreciated, and some of these wonderful wild canyons were dammed for irrigation storage and domestic use. 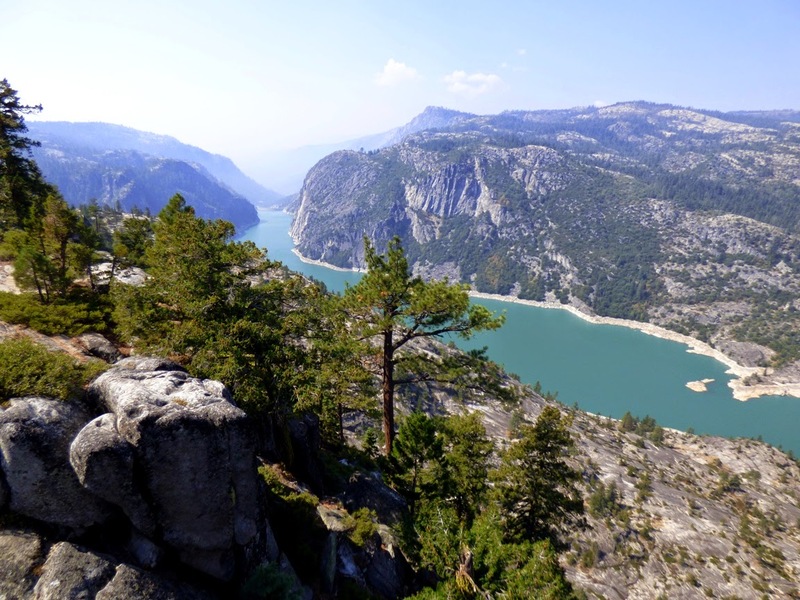 Hetch Hetchy is the most familiar, but the canyon below Donnell Vista on Highway 108 has also been inundated. 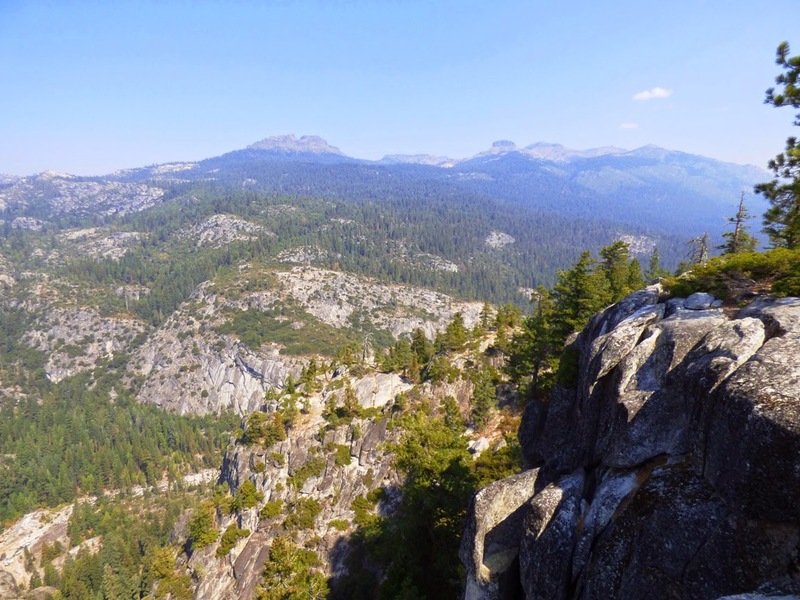 Still, the glacial heritage of Middle Fork of the Stanislaus is evident from the viewpoint. The steep canyon walls of granitic rock and the overall U-shape of the valleys are the result first of ancient river erosion and then modification by thick rivers of ice. If you look at the second picture above, you can see some unusual looking mountain peaks. Their blocky flat aspect indicates they are composed of something different than the "expected" granitic rock. They are the remains of lava flows, ash flows and volcanic cones that once covered this part of the Sierra Nevada. Indeed, until 9 or 10 million years ago, the Sierra looked far more like today's Cascades Range than the lofty glacial peaks we see today. There were a number of snow-covered stratovolcanoes, but much of the remainder of the range was composed of lower hills. The upper reaches of Highway 108 where it crosses Sonora Pass cut through some of the volcanic rocks. We stopped a mile or two short of the pass to get a detailed look at the granitic rocks. 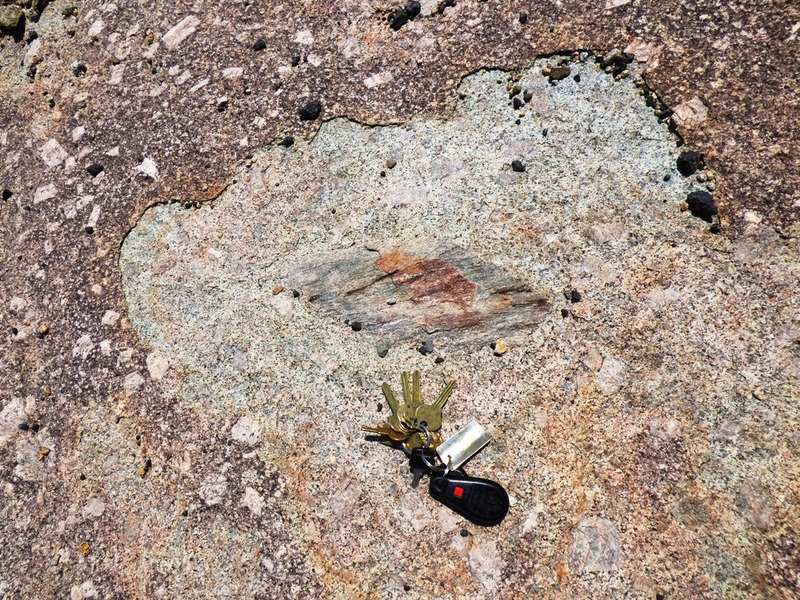 Depending on the relative proportions of plagioclase and orthoclase feldspar and quartz, rocks may be identified as granite, granodiorite, tonalite, diorite, or monzonite. The rock exposed just below the pass is called the granodiorite of Topaz Lake, dated about 89 to 83 million years ago, during the Cretaceous era. It was intruded in the deep crust about 4 or 5 miles down where it cooled slowly, forming visible crystals of feldspar, quartz and dark minerals like biotite mica and hornblende. Glaciers scoured the surface of the granodiorite, polishing it and providing a nice view of the structure of the rocks. Some of the orthoclase (potassium feldspar) has formed huge blocky crystals easily visible in the shot below. Even better, during the intrusion process, blocks of the surrounding rock broke off and sank into the magma. Composed of minerals that had higher melting points, it didn't melt, but instead persisted as an alien mass in the granitic rock. Such inclusions are called xenoliths. They provide a peek at what existed here before the intrusion of the magmas. We drove over Sonora Pass and headed into the barren lands beyond. Our destination was the site of a gold rush, but not the one that Californians are familiar with. I've been to Yosemite over 30 times now but never had the opportunity to cross the Sonora Pass. Guess I need to do that now.